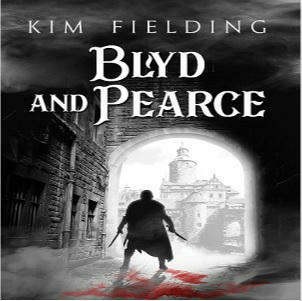 Blyd and Pearce by Kim Fielding Guest Post, Excerpt & Giveaway! Are you a fan of noir film or fiction? Obviously, I am. If you’re unfamiliar with the genre, it involves crime dramas. It’s related to hardboiled detective stories (think Philip Marlowe, Sam Spade, Mike Hammer), except in noir, the protagonist is generally personally involved in the crime in some way rather than simply investigating it. In these worlds, the protagonist is a cynical antihero, the system is corrupt, and we’re treated to the seedy sides of both the setting and human nature. American noir fiction first arose in the late 1920s and early 1930s, maybe as a result of the Great Depression’s gloom. However, it became more popular in the 1950s. I wonder if this was partially a response to the era’s strong conformist pressures. Noir heroes are nonconformists—they’ve seen how crooked the authorities are, and now they’re just out to protect themselves. Except they also tend to operate under an internal code of honor, which means they may end up protecting others who are wronged. I believe WWII also contributed to noir’s popularity, in that it lent a sense of fatality and a recognition of the depths of human evil. Film noir developed along a parallel but not identical route, reaching a peak in the 1940s. It was heavily influenced by the filming style known as Expressionism. Originally shot in black and white, its settings were dark (noir, in French) and gritty, with lots of shadows and maybe smoke or fog thrown in for good measure. As in noir literature, our protagonists here are antiheroes, often with moral ambiguity. Although there’s variation within the genre, a number of other tropes are common. Urban settings. Convoluted plots. A femme fatale (my story has an homme fatal instead). A sense of alienation and pessimism. Lots of drinking and smoking. I think noir might have hit its peak some decades ago, but it continues to show up regularly in film and print. LA Confidential and Fargo are a couple of my more recent favorites. One fun thing about noir is that it can blend really nicely with speculative fiction and other genres. And that’s what I’ve done with Blyd and Pearce. Our hero is a private detective who’s been done wrong by society and the legal system, and whose life is about to get a whole lot more complicated. But instead of Los Angeles or Chicago—two common noir settings—this book takes place in a medieval fantasy setting, in a city called Tangye, where magic is as real as corrupt politicians. Do you have a favorite noir movie or book? Please comment below! And make sure to enter the Rafflecopter too. Win an Audiobook version of The Bureau: Volume 1! Win an Audiobook version of The Little Library! Win a $10 Dreamspinner gift certificate! Posted on July 17, 2018 July 17, 2018 by pixiemmgoodbookreviewsPosted in Author Giveaway, Book Blast, Dreamspinner Press, Excerpt, Guest PostTagged Dreamspinner Press, Gay High Fantasy, Gay Mystery, Gay Suspense, GLBT High Fantasy, GLBT Mystery, GLBT Suspense, Kim Fielding. Previous Previous post: A Mage’s Power by Casey Wolfe Release Blast, Excerpt & Giveaway! Next Next post: BadLands by Morgan Brice Blog Tour, Excerpt, Review & Giveaway! Congrats on the new book! I love mystery/conspiracy and swords-and-sorcery fantasy, so this looks right up my alley! Congrats on the new book! It sounds like a great read! I received a message saying I won this giveaway. Thanks so much!! I can’t wait to download it and start listening, I’m sure it’ll be as good as I expect it to be. What a fun win!